Wietecha has spent a lifetime striking up conversations with strangers and looking to make connections with people. Her chatty and inquisitive nature has always made making new friends and acquaintances easy, whether she was volunteering at Westchester High School, sitting next to someone at a sports game or participating in a book club. While she loves to talk, Wietecha never dreamed she’d have her own radio show and have the chance to interview people from all walks of life. The unexpected passing of her husband, Butch, in 2009, however spurred her to step outside of her comfort zone. Living up to her new slogan, Wietecha who always had a full social calendar, crammed her days with even more activities. She took the advice of a good friend and “never said no to an invitation.” Deciding to switch it up and began being “the inviter not the invitee,” Wietecha, a die-hard basketball fan with season tickets, invited the women she had sat with for years at the Los Angeles Sparks’ basketball games to her home for dinner. There she met radio producer Deborah Blaine and the two hit it off. Seeing potential for Wietecha to have her own radio show one day, Blaine invited her on a cooking show she produces on LA Talk Live, an Internet radio station that broadcasts out of Westchester. Impressed by her performance, Blaine encouraged her to start a blog and began crafting her storytelling style. Wietecha immediately started blogging about her life experiences and used her frequent trips across America and to exotic locales like Vietnam as subject fodder. 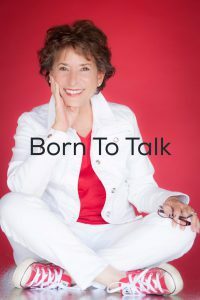 After a year blogging, practicing her public speaking at Playa del Rey’s Speakers by the Sea Toastmaster Club and formulating ideas for her show, Wietecha’s radio show “Born to Talk” will premiere on Monday, April 13 at 1 p.m. The show can be watched and listened to live (or archived) on latalklive.com or iTunes Radio. On the eve of launching her new career as a radio personality, Wietecha is excited to seize the moment and have the opportunity to share her passion for people and conversation through the airwaves.